Are Aluminium-Scandium Alloys the Future? It is well known that small quantities of scandium, a rare earth metal, added to aluminium alloys significantly improve the tensile strength and physical properties of the finished product. Aluminium –scandium alloys (Al-Sc alloys) were discovered and patented in 1971 in USA and have been used in recent years in sports equipment (such as baseball bats, tennis rackets), bicycle frames, tent poles etc. American firearms company Smith & Wesson manufacture revolvers with the bulk made using Al-Sc alloys. It is also used in the aerospace sector for the production of welded gas tanks, structures for dashboard panels and compartments and large stamped and welded structures. Russian military plane MIG 29 is recognised as the aircraft with the highest content of Al-Sc alloys. In a nutshell, researchers claim that scandium provides the highest increment of tensile strength per atomic percent than any other alloying element when added to aluminium. However, there is no known big commercial use of scandium, and the global yearly demand for the metal is relatively very small, around 20 tonnes. 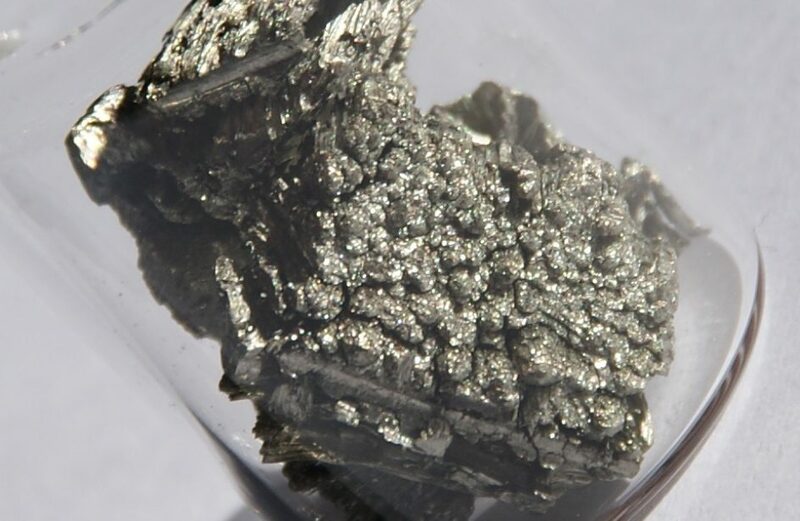 The reason for this is usually found in scandium’s low concentration and its difficulty in separating it from the ore, pushing costs to elevated levels (according to recent figures, around US$7000 /kg of concentrate), thereby hampering its commercial use. As such, despite a growing interest from the automotive industry, among others, the price of Al-Sc master alloys is still too high for most commercial applications. So far scandium has not generally been mined, and it has been extracted mainly as a by-product in the mining of iron, uranium or tantalum, mostly in Russia and China. The good news is that this could soon change due to newly discovered deposits of the mineral Thortveitite in Australia, in the South-eastern state of New South Wales (NSW) and North-eastern state of Queensland, which possess a significant quantity of scandium oxide (around 30-40%). Work has started on 3 new mines that will be able to produce together 112 tonnes every year of scandium oxide. This could be a game-changer from next year, especially in the automotive industry. Since global production will increase five-fold, we can expect that this supply side boost will pave the way for much lower market prices and an increase in the metal’s use – and even compete with 3rd generation AHSS. Australia’s mining projects are advancing fast and soon will be able to produce first quantities of scandium. The Nyngan project in NSW will be able to produce 80,000 tonnes of high-grade scandium ore and 95,000 tonnes of low-grade ore per year, which translates to around 40 tonnes of scandium oxide annually – the primary form of refined scandium. The second project in NSW, the Syerston project, has an estimated life of 20 years, and aims to produce 78,000 tonnes of Thortveitite ore per year, enough to extract about 42 tonnes of scandium oxide per year. Finally, the third NSW mine, which has only recently started, is called Owendale. It will produce around 30 tonnes/year of scandium oxide for over a 70 years period. According to CleanTeQ Metals only a 1% uptake of a 0.2% Al-Sc alloy would require 167 tonnes p.a. of scandium oxide Sc2O3, just for the North American and European markets. Taking into account a ~10% CAGR in global use of aluminium in light vehicles, a modest 1% uptake (1.5 kg of Sc2O3 per car) by 2025 would require 433 t/y Sc2O3. Long term supply contracts at affordable (lower) price would be necessary for wider adoption of Al-Sc alloys in automobiles in future. Very little amount of scandium is needed to improve aluminium alloys properties, less than 1wt% (weight percent). For instance, alloying scandium with aluminium-magnesium alloy increases its yield strength by up to 150% while preserving density and resistance to corrosion. In addition, scandium increases the quality of the alloy’s welded joints, avoiding cracking at welds and increasing fatigue life by up to 200%. This recommends Al-Sc alloys as an excellent choice for wider use in automotive industry in perspective (future). 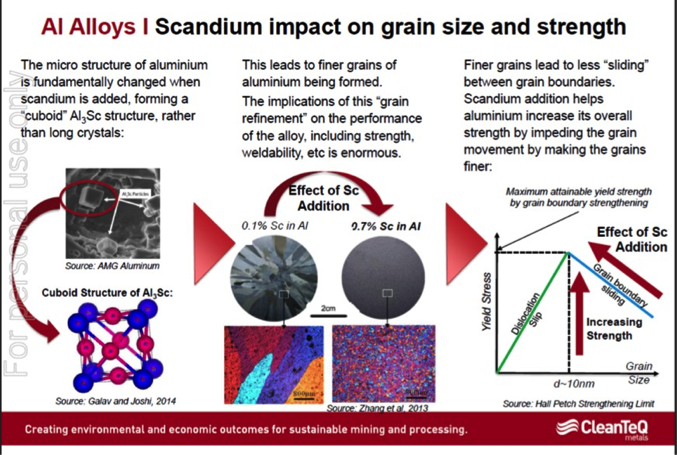 Scandium strengthens aluminium in three different ways: grain refining, precipitation hardening, and inhibiting recrystallization, or grain growth. Due to its fine grain refinement, scandium alloys reduce hot cracking in welds, increase strength in the welds and deliver better fatigue behavior. Welding filler/ thread with scandium has great potential for aluminium. Scandium increases the recrystallization temperature of aluminium alloys to above 600°C, well above the temperature range of heat treatable aluminium alloys. Thanks to their high resistance to corrosion, high thermal capcity and durability, Al-Sc alloys are an excellent choice for use in ships and boats, for the manufacturing of pipes for the oil and gas sector, building structures bridges, masts and electricity pylons in railway construction, high voltage transmission wires, as well as to manufacture liquid hydrogen tanks that operate in sub-zero temperatures. 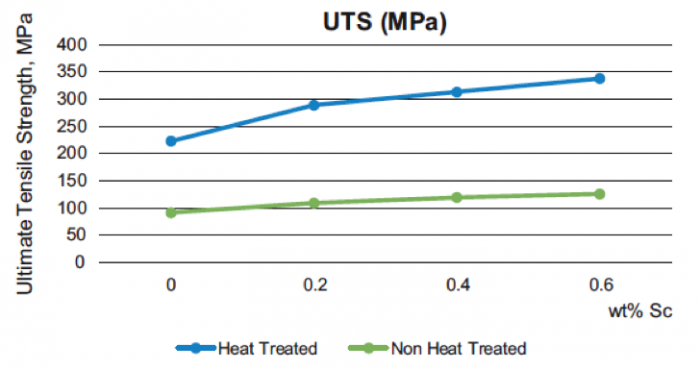 UTS vs. Wt.% of scandium in A356 alloy. Source: Lim YP, Yeo WH & Masita A: Effect of heat treatment on gravity die-cast Sc-A356 aluminium alloy. Manufactruring Rev. 2017,4,3. Airbus Group APWorks GmbH, Germany, in cooperation with Airbus Group R&D, has developed Scalmalloy, a high-performance scandium-aluminium magnesium powder metal alloy designed for additive manufacturing of high-strength aerospace structures. Scalmalloy has exceptional high-fatigue properties with specific strength approaching that of titanium. In comparison, the AlSi10Mg aluminum silicon powder, widely used for additive manufacture, is only half as strong. It is stated that using aluminium-scandium alloys could reduce the weight of a large aircraft by 10%-15%. Several years ago, UC Rusal developed technology to produce scandium oxide from red mud – a by-product of alumina production. 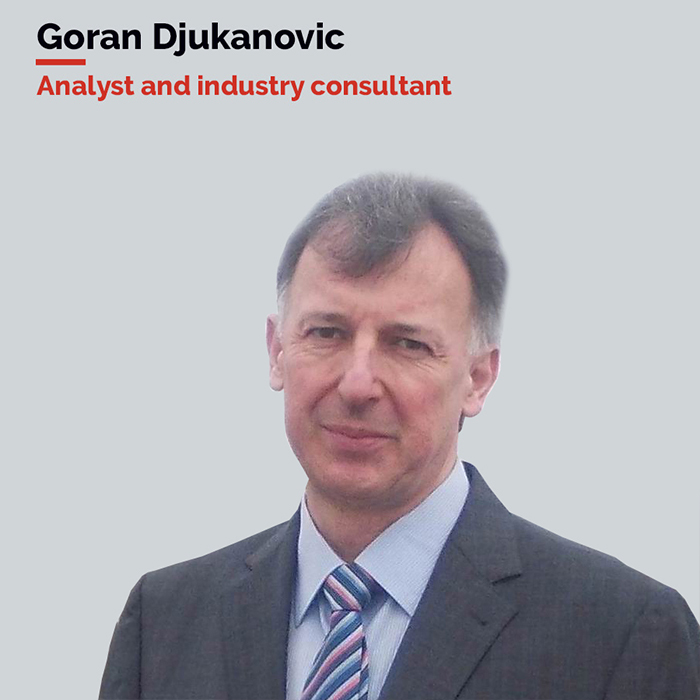 Currently, specialists at the company are working on creating a cost-effective aluminium alloy with a scandium content of less than 0.1%. The alumina production process generates usually between 2 and 2.5 tonnes of red mud per tonne of alumina produced. The content of scandium in red mud may be up to 120g/t. Rusal developed the process of scandium concentrate recovery based on carbonisation leaching of scandium. Owing to its scarcity and limited production, scandium is one of the most expensive metals in the world. Prices for 99.99% pure scandium (RE: 99% min. | Sc/TREM: 99.99% min.) have fluctuated between US$4000 and US$20,000 per kilogram over the past decade,a ccording to Strategic-metal.com. Due to the limited amount of material produced globally and the limited market for scandium, there is also a wide range of prices offered for the metal at any given time. A recent offer for 99.9% scandium concentrate was at US$15,000 /kg. The more widely used form in commercial applications, scandium oxide (Sc2O3), was recently offered at prices of around US$7000/kg, which is in the range of 20-year average. 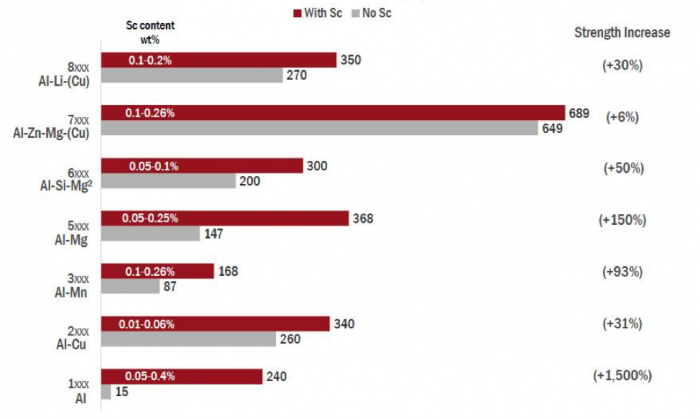 Depending on the percentage of the scandium alloying element, the price of the Al-Sc alloys are expected to cost between 30% more than non-scandium alloy (at scandium levels of between 0.06 up to 0.12 wt% as used in Al-Zn-Mg (Cu) alloys), and 100%.